"I know I can stream WMV files from my laptop using Media Center with my Xbox 360. I have a few videos that are widescreen in MPEG format and these won't stream. How would I convert the widescreen videos into widescreen WMV files?" When you say MPEG video, I'm going to assume you mean MPEG-1 or MPEG-2, rather than one of the MPEG-4 codecs which often appear with either an AVI or MP4 extension. MPEG-2 files are supposed to stream from Windows Media Center Edition to Xbox 360, but I've seen several instances where this is not the case. Microsoft has a list of supported formats in their Xbox 360 Video Playback FAQ, but they aren't entirely clear about which file extensions work for each codec. Knowing which MPEG variation your specific files are is further complicated by the fact that .mpg or .mpeg files can both have different audio and video formats inside them, which I realize doesn't help solve your video playback problem. Assuming these are either MPEG-1 or MPEG-2 files with a .mpg or .mpeg extension, you can convert them using the free video converter WinFF. The following steps will work to convert any MPEG file to WMV, whether you have an Xbox 360 or not, so if you merely need a WMV file to use for any reason, the conversion steps below will work. After downloading and installing WinFF, launch the WinFF application and select the MPEG file or files you want to convert from MPEG to WMV. Choose the WMV option from the Convert to... menu. Select the Output folder location where you want to save the converted file or files. 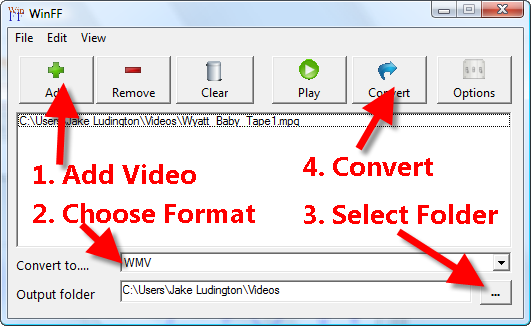 Click the Convert button to start converting MPEG files to WMV.